The filing stopped short of accusing the president of committing a crime. 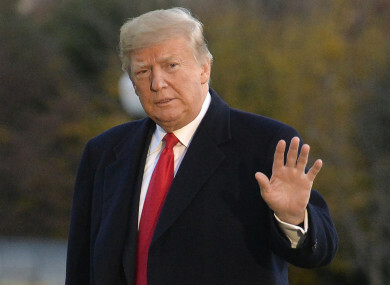 THE US JUSTICE Department has said that Donald Trump directed illegal payments to buy the silence of two women whose claims of extramarital affairs threatened his presidential campaign, the first time prosecutors have connected Trump to a federal crime. In a court filing , prosecutors said former Trump lawyer and fixer Michael Cohen arranged the secret payments at the height of the 2016 campaign “in coordination with and at the direction of” Trump. Cohen has previously said Trump was involved in the hush-money scheme, but court documents filed ahead of Cohen’s sentencing made clear prosecutors believe Cohen’s claim. But there’s no ambiguity in yesterday’s filing that prosecutors believe Cohen’s act was criminal and Trump was directly involved, a disclosure with potential political and legal ramifications for a president dogged by investigations. The payments are likely to become a target for House Democrats gearing up to investigate the president next year. It’s unclear whether Trump faces legal jeopardy over his role. Federal law requires that any payments made “for the purposes of influencing” an election must be reported in campaign finance disclosures. The court filing makes clear that the payments were made to benefit Trump politically. Email “For the first time - prosecutors have connected Trump to a federal crime”. Feedback on “For the first time - prosecutors have connected Trump to a federal crime”.